Airbnb are never far away from the headlines, but the homesharing giants have been outdoing themselves in 2018. 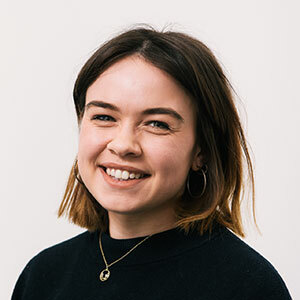 Alongside a plethora of announcements made at the end of February, including two new tiers of homes and a long-awaited loyalty scheme (Superguest), Airbnb revealed earlier this year that they'd struck a partnership with hotel distribution platform (and Triptease partner) SiteMinder. The move was met with an understandable flurry of excitement, principally due to the proposed 3-5% commission fee for hotels listing on the site (which are the moment are limited to boutiques and smaller properties). This puts Airbnb in direct competition with online travel agents - and potentially with a much more attractive offering to hoteliers. Hotels have been allowed to list on the platform for over a year now, but with the SiteMinder partnership Airbnb are really making their long-term vision clear. Hotels using SiteMinder's channel manager will now be able to push rates to Airbnb just as easily as they would to an OTA. This is about saying: "Look, we're open to distribution through the kinds of channels that hotels want to use." Amidst all the excitement, though, hoteliers would do well to remember the principle of price parity and providing potential guests with a consistent experience across all of the sites they are browsing. With guests already on a site pushing a potentially competitive product (vacation rentals), it's especially important to ensure that prices on Airbnb are not under- or overpriced compared to your other rates, therefore providing an extra incentive to book elsewhere. Let's walk through an example scenario. It's important when thinking about different levels of commission to start with what the guest is paying. As always, you want to ensure price parity across all your online distribution channels. Of course, you may want to offer a cheaper price direct, but you certainly don't want to be giving guests a better price elsewhere. Let's say the total amount the guest pays is $200. That's the same in this example across Airbnb, the OTA, and direct. The taxes, which are important in this example because Airbnb treats taxes in a different way to OTAs, are (let's say) $18, or 10%. Then, just for Airbnb, there's a guest service fee, which they say is between 5% and 15%. It's hard to know how that is going to vary, and it may well be one of the challenges of working with Airbnb in the future - they could possibly vary that guest service fee without notifying the hotel each time. For now though, let's assume it's a 10% fee that they're charging the guest - so $17. (That's 10% of the hotel's rate including Airbnb's commission). Then comes to the commission. Airbnb will be charging a commission that in this case would amount to $6. The OTA, because commission is payable on the full rate including taxes, will be charging $36. We've put the OTA commission at 18%, which is a figure we see quite frequently. Some booking engines charge a small commission fee, so we've set the commission for a direct booking here at $5. What matters is that the guest pays the same price across all three channels. So, what does the hotel get in each scenario? Obviously, generating direct traffic can also cost money, so we could easily reduce the direct amount down to more like $161 if we said there was another 10% spent on acquisition. Even then, it's still above both the third parties - and you've acquired a direct relationship with which you can improve the guest experience. So, should hotels be giving Airbnb a lower price as their commission fee is lower? Clearly not. Giving lower rates to services who take a smaller commission fee, but who charge for an additional guest service fee (which could be subject to change at any time) is a risky move for your parity. To be really sure of never being undercut, work from your most conservative estimate - which might be that Airbnb only charge a 5% service fee as standard. Use that as your baseline and only push up to 10% in your calculations if that’s what they do. 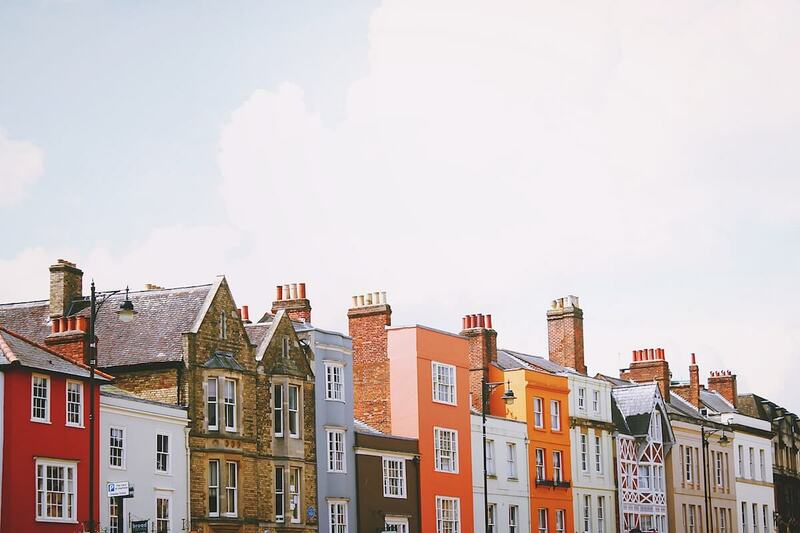 As with any distribution channel that has the potential to undercut your direct price, tracking Airbnb’s service charge changes will be vital for maintaining parity. 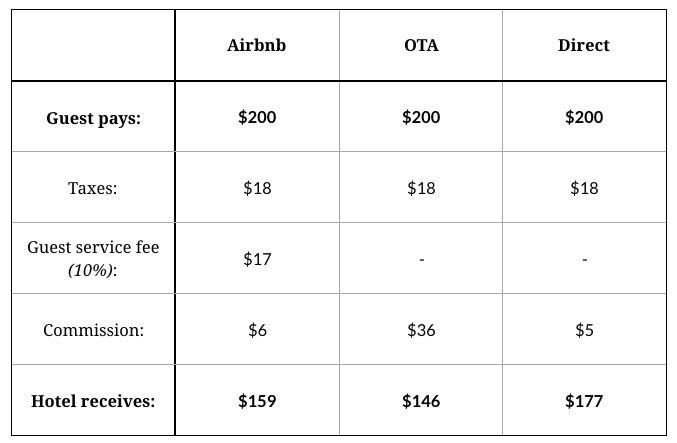 The key point here is the significant difference between what you pay Airbnb and what you pay an OTA. If this has the potential to put pressure on the OTAs, it's great news. It may be that the difference is so stark that Airbnb can't afford to market itself in the way Expedia and Booking.com do, which might mean they might not be able to get to volume. If they get to volume, though, they'll be putting no small amount of pressure on the commissions that other third parties are charging. We've laid out the numbers like this because many of the articles we've seen so far on the issue have detailed what you'll pay to OTAs, what you'll pay to Airbnb, etc. We think the right place to start with these calculations is at the assumption of price parity. Guests know that they will have to pay the Airbnb service fee, so you need to include it in your thinking when setting your rates.